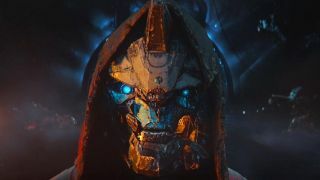 Well before Destiny 2: Forsaken was even released, Bungie began hyping the death of one of the series' most prominent and likable characters: Cayde-6, the Hunter Vanguard leader. Cayde's death has played a major role in Destiny 2's story ever since - which makes it doubly odd that his old dialogue is still in Strikes and missions - and Bungie's now turned the spotlight on his past through a free new comic titled Cayde's Six. You can read it here. The 12-page comic is the first of several upcoming issues chronicling one of Cayde's Tangled Shore adventures. Cayde makes for the Shore to track down Araskes the Trickster, one of the eight Barons in Forsaken, but not before assembling a crew of new and old faces: Petra, Banshee the Gunsmith, Hawthorne, a Hunter scout named Nadiya, and a mysterious man named Jin who could pass for a Drifter lookalike (or prototype?). Cayde's Ghost was killed by Pirrah the Rifleman, and he himself was shot by Uldren, but the Trickster and the other Barons also played a clear role in his death, which makes this little hunting party seem much more personal. The Trickster was also one of the more interesting Barons - at least in my opinion - but she never got much screen time, so it'll be interesting to see how she's characterized here. I'm not usually a comics guy, and the story of Forsaken isn't exactly fresh in my mind, but I have to admit I rather enjoyed this little story and I'm looking forward to the next part. I'd love to see all eight Barons get this kind of character development. Bungie's recent string of expanded universe media has proven unexpectedly compelling - the Season of the Drifter short stories still come to mind whenever I queue for Gambit Prime.